It was 2:30 AM and the window was boarded up after the first break-in. I was exhausted, of course, but found myself strangely disappointed that the crew of one who had arrived to help me had shoveled up all of the broken glass and hauled it away. Well, not all of it. And therein lay the redemption of the moment. Every moment has its redemption, I believe, though we may not see it immediately. In fact, with the majority of bits of time that flow by, we probably do not see it at all. Yet it is there, hidden in each moment, however difficult, painful or frightening, just as Christ’s redemption of us is hidden in every breath we take, whether we are aware of it or not. Over the next couple of days, I gathered fragments of broken glass that were concealed in random places in the carpet, their presence given away by unexpected glints of light. At first, I had only tiny pieces and thought perhaps I could make a small sculpture with them. However, when the man came to repair the window, there were some larger pieces of glass to be removed from the frame. Without a hint of embarrassment (okay, maybe a hint), I gave him a box and asked if he could save them for me. He did so gladly, resulting in my having a collection of glass fragments, varying in shape, most of them quite small but a few a bit larger. In the days that ensued, I pondered the fragments and what they might be. But I did not have to ponder for long. It soon became quite apparent what they were trying to say to me. The first step was to select the pieces. I wasn’t going to try to cut or shape them in any way. If they had sharp edges, they had sharp edges. I could not avoid that reality. After I had the pieces, I began painting them with alcohol inks, using simple colors and procedures. A bit of texturing appeared when needed but everything flowed as it was meant to. I laid the pieces to dry on my desk and then moved them to rest on the flat surface of my printer while I tested the glue on some scrap. I would glue the pieces together in the next day or two. When break-in number two occurred, the focus was, of course, on what was missing. The printer had been taken, the serial number was given to the police and the reporting rituals repeated. It was only after I had left for work the next day that I remembered that my glass pieces had been on top of the printer. What had become of them? Had they been broken? I felt a twinge of sadness but again, a call to let go. When I returned home that night, I searched the floor around and behind the desk, managing to find each and every piece, down to the tiniest fragment. Perhaps a couple of new chips had appeared in their already uneven edges but they were still speaking the same image to me. I breathed a sigh of relief and a prayer of thanks. The bringing together of the pieces and fragments into the whole I had seen in my mind was fairly effortless. The glue dried clear. It was finished. I wasn’t sure just how the sculpture should stand so that its image could be received but a way came to me that worked. My cell phone stood in for the camera lost to fate and it happened. And then it crashed. My propping had lasted just long enough for the image, when the glass structure fell and came apart at its glued joint. Broken by my own hands, the cross lay in pieces. With glue and grace, it again assumed its form and was left on my desk to dry once more. Then came break-in number three. At this point, there was so little left to steal that it took some study to determine what was missing. What was most evident to me as I entered the room, however, was that the glass sculpture of the Savior lay on the floor, having been knocked out of the way. All I could do, all I can do, is contemplate the brokenness. Not the brokenness of my bit of simple art. It survived mostly intact and is of little consequence. The Cross, after all, is not about art. Rather, what my heart sees before it is a world of brokenness – my own and that of all of humanity. Shattered we are, our souls like my panes of glass twice broken, smashed and sprayed across the microcosmic universe of my bedroom. From the evil lurking within our seemingly innocent passions comes the blow that shatters. And from the wounds brought by shattering blows, grow still more passions. We are dead and broken. And a bit of glue cannot make us right again. But this One on the cross…who is He? Who is He and why does He allow Himself to be knocked about and broken at our hands? Why does He take our brokenness upon Himself? Where can such a love come from that He would want to bring us to wholeness and life again? 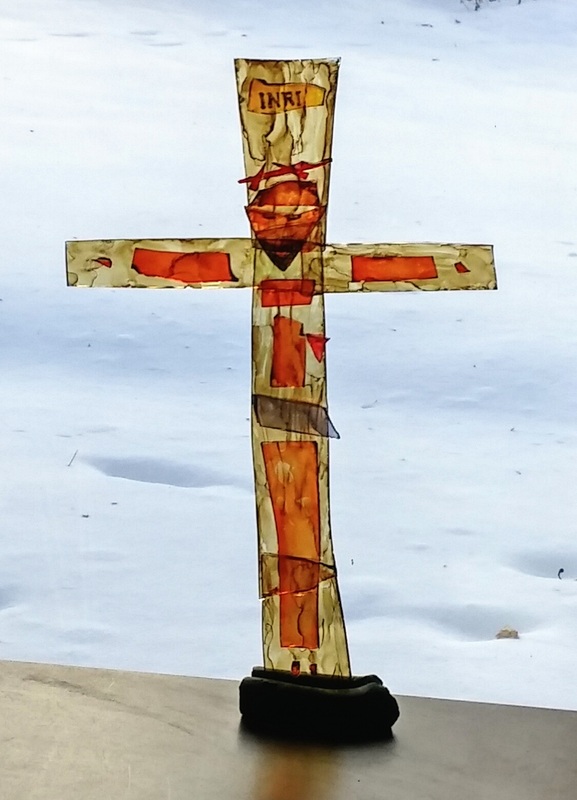 Our Lenten journey begins and we bring Him our shattered souls. To the One who delivered up Himself completely, we deliver ourselves in our confusion and uncertainty, hoping to learn what it means to truly repent and accept the Gospel into our hearts. This entry was posted in Uncategorized on February 20, 2015 by mary. I should read this often during lent. Blessings to you (as if i could offer what is given to those ordained for God’s work to do, and ultimately what is only God’s to offer) yes, blessings and prayers. Thanks, Al. I appreciate your prayers and blessings. I’m as broken as the next person, without a doubt. I’ve been grouchy much of the day today but that doesn’t make for a good article so I don’t usually post THOSE things :-). The brokenness is all over, inside of me and outside of me. I pray to learn how to truly repent this Lent. I enlarged the image. I want to make a print — if OK with you –and share it, or just keep it nearby as a reminder of what you have been through and what you wrote here: how all our break-ins and break-downs are connected. It will be a help towards prayer for the breaker within me as well as for the breakers among us ; then for all of us, broken and needing to be put back together. Go right ahead, Al. I am honored that you want to save and share the image that means so much to me.